Zomato, a global restaurant search and discovery app, is nothing short of a dream come true for the foodies and for those who can’t cook even if their life depended on it. Every month, Zomato connects 45 million users with 1.3 million restaurants across 24 countries, and to become the only food app one will ever use, it hires interns! What are the types of internships at Zomato and who is eligible? Zomato offers a variety of internships to students pursuing bachelors or masters in computer science or related engineering disciplines, design, and MBA across their offices in Mumbai, Delhi, Ahmedabad, and Gurgaon. Students can look for internships across profiles such as graphic design, product design, content and copywriting, operations, web development, business development, etc. Zomato internships range from a duration of 1 to 6 months and offer a stipend of 10K – 25K. How to apply for an internship at Zomato? Interested students can apply to a Zomato internship through their official careers page. You would be asked to upload a resume and write a cover letter while applying to an internship at Zomato. 2. Emailing the HR and employee referral – You can directly email your resume and a cover letter to the HR executive of Zomato. She’ll get back to you if your profile matches their intern requirements. You can also connect with employees at Zomato via LinkedIn and request them to refer you. 3. Internshala – Zomato posts internships across various profiles on Internshala quite often. You may apply to a Zomato internship by answering a simple ‘Why should you be hired?’ question. 4. Campus recruitment – Zomato hires interns from select few colleges like NID, NIFT, IITs, and NITs. What after applying to a Zomato internship? 1. Can you tell us how to parse XML? 2. What are the advantages of object-oriented programming? 3. Write a program to calculate the angle made by the hour and minute hand of a clock. 4. What is a Shallow copy in Java? 5. What happens when an object is created in Java? 6. Design a snake and ladder game. 7. How would you implement a dictionary? 8. Find the sum of all the elements of a sub-matrix. 1. If you could add or remove a feature in our app, what would it be and why? 2. Why do you want to work at Zomato? 3. Why do you think you’re a good fit for this role? 4. If you have three major tasks which are due at the same time, how would you manage your time? 5. What are your favorite restaurants? 6. What do you like about the Zomato website? What to expect once your internship in Zomato starts? Eat. Work. Eat. Repeat. Yes, that’s the routine interns follow at Zomato. You will be introduced to your team, your manager, and the senior employees at Zomato on your first day. At Zomato, you’ll get a chance to work with insanely-inspiring Zomans and an opportunity to work on an entire project of utmost significance. 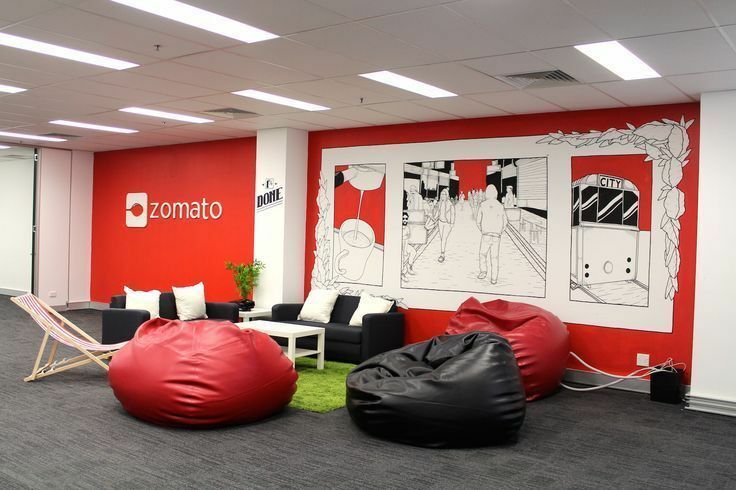 Zomato offers a pretty chill work environment and flexible work timings to its interns. A raw and vibrant workspace with bamboo dividers and recycled doors, the colourful office of Zomato, Gurgaon, has a cafeteria and a ping-pong table with cushions scattered around the office. While at Zomato, brace yourself for theme parties and table tennis matches. You’ll also have an unlimited supply of coffee and free food! Duh, isn’t that obvious! 1. Don’t forget to brush up the concepts of web sessions and cookies if you’re up for a technical interview. 2. Practice a few puzzles before your face-to-face interview at Zomato. 3. If you’re applying to a design profile, know about their website and app in and out. Suggest some changes in their product and list a few things that you find commendable. 4. Follow Zomato’s Facebook and Twitter pages to keep informed about the latest Zomato openings. 5. Always be on time. Zomato values discipline intensely irrespective of its unconventional work culture. For a closer view of a Zomato internship, you can read how Gaurav built his career as a UX designer and how Tanika explored her interests through their internships at Zomato. Now that you have an understanding of Zomato’s hiring process and know how addictive life at Zomato is, what are you waiting for? Apply to the current Zomato openings here and have a wonderful meal internship experience. This information really helps me. Thanks. Can I get Internship Notification on my gbwhatsapp mobile number. this information is very helpful for me to thank you for sharing this important information. Last two day before relatives came to my house we are a long ago meet all are gathering one place we could very happy. relatives are requested in mother we aren’t prepared for lunch. so all going to the restaurant. I am telling that food was available in online food apps we order it online. I was subjected to the best offers available online searching and selected for the site we can use the promo codes I could save a lot of money and 50% off in online shopping in this site saveplus website is one the best coupons site thank for the saveplus. I think it is one of the best apps that deliver good quality food in a short time and that too at affordable prices. Keep adding more services and special offers to make your customers feel happy. thanks for sharing this post. I got so many information from this blog. Great info . Thanks for sharing.